The televison seriesAmerican Gods is out on DVD. 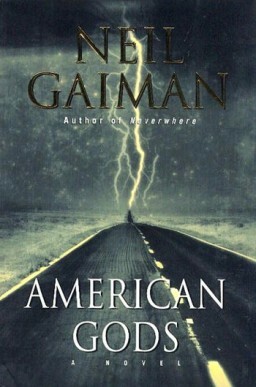 It is based on the convoluted Series of interconnected tales written by Neil Gaiman. The television series was developed by Bryan Fuller and Michael Green. Gaiman serves as an executive producer along with Fuller, Green, Craig Cegielski, Stefanie Berk, and Thom Beers. It starts In the present day when A chap named Shadow Moon is caught trying to rob the casino where he first met his wife Laura and is sent to prison. Sadly Laura, dies in a car accident just before Shadow Moon is released from prison. Shadow then meets Wednesday, who offers him a job as a bodyguard and meets Wednesday again at a bar where he learns that his best friend, Robbie, died in the same car accident as his wife Laura. Mad Sweeney introduces himself to Shadow as a leprechaun, and goads him into a fight. Shadow later attends Laura’s funeral, and learns of her affair with Robbie. He is then abducted by the Technical Boy who tries to kill him, after escaping Shadow meets the New God Media, who takes the form of Lucy Ricardo. Shadow and Wednesday then travel to Chicago to an apartment belonging to three sisters and a slaughterhouse worker named Czernobog, who takes a dislike to Wednesday. Shadow dreams of Zorya Polunochnaya, youngest of the Zorya, who pulls the Moon from the sky and gives it to him in the form of a silver dollar. Shadow then forces Czernobog to go to Wisconsin. Meanwhile Laura awakes in the desert where she is discovered by two Old Gods, Mr. Ibis and Mr. Jacquel, who restore her damaged body. Jacquel reveals himself as Anubis and vows to reclaim Laura’s soul when her mission is done. Laura tries to find Shadow. Back In New York City, an Omani businessman named Salim meets a taxi driver, who is revealed to be an Ifrit. Elsewhere, Shadow is confronted by Mad Sweeney, Who exhumes Laura’s coffin. Shadow then assists Wednesday in conning a bank’s business depositors. Later he finds the newly restored Laura waiting for him. Unfortunately Shadow and Wednesday are later arrested for Their crime. Mad Sweeney then tries to retrieve his coin from Laura but discovers that it is inside her, giving her life. He warns her not to trust Wednesday. In the jail, Media (now in the form of Marilyn Monroe) and Mr. World confront Technical Boy again. The New Gods offer an alliance with Wednesday, promising to help him “find his audience” by sending a missile named Odin to attack North Korea. Meanwhile Shadow and Wednesday manage to escape from prison. A group of Mexican illegal immigrants attempting to illegally cross the border into the U.S. pray to Jesus, who comes and attempts to protect them. He is shot dead while doing so. Shadow questions what he saw at the police station and admits to Wednesday that Laura is back from the dead. Sweeney teams up with Laura, seeking her resurrection so he can reclaim his coin. They meet Salim, who joins them in order to find the jinn. In Virginia, Wednesday takes Shadow to meet the Old God Vulcan, who maintains control over a small town through their belief in the right to bear arms. Vulcan agrees to stand with Wednesday and forges him a sword, but he later betrays them by telling the New Gods where they are. In revenge, Wednesday kills him and curses his believers. Essie, is an Irish girl is On a ship to America, who seduces the ship captain and asks him to take her to London. There she becomes a thief; but she is caught and ends up Pregnant and transported to America again, where she marries her master who, upon his death, leaves her in charge of his farm. the leprechaun Mad Sweeney visits Essie on her deathbed. Later As Sweeney and Laura are driving, he tells her that he is taking part in Wednesday’s war to atone for deserting as a soldier. The truck overturns and Sweeney’s lucky coin falls out of Laura.